The first time I detected something wrong with my heart’s strange arrhythmia was about 8 years ago (at age 62). I had no idea what it was. All I could feel was an annoying sensation in my chest, clearly my heart not working smoothly. It was a rare occasion when I would feel such symptoms. I went to my family doctor. Dr. S. Mercer, to explain what I was feeling at such times. But every time I went to the office, my symptoms would not be there. I asked the doctor to arrange a special office visit when I would have such symptoms, so that they could have the electrocardiogram ready for fast access. That was the only way I was able to finally determine my malady—A-Fib, an arrhythmia. Later on my sensations with an active A-Fib were mostly feeling uncomfortable with a bad feeling (in my gut) and the erratic beating of my heart. Eventually, I began to also feel dizzy and had no energy. A few times I had to be taken to the ER. After finally knowing what A-Fib was, I started to remember and take note as to what I had done at such times to provoke it. The main issues I could relate to was stress, dehydration, too much caffeinated coffee, and getting angry. I also noticed that when I would take an antibiotic, it would increase the frequency and strength of A-Fib activity; the same with foods containing MSG. I decided to go vegetarian (but eating fish) to reduce such exposures to foods laced with unhealthy chemicals, especially food (meat, milk, eggs) from animals grown with antibiotics and hormones. A very disappointing experience while visiting various doctors was the constant pushing of drugs and no conversation about healthy diet. 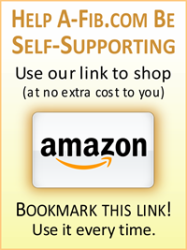 I read a few books on the subject of food and the interaction with our body. The best book was THE CHINA STUDY. It will give you an education about food, its sources and dangers. I was fortunate to find a cardiologist who would actually discuss better nutrition before pushing meds—Dr. John Backman. I was fortunate to find a cardiologist who would actually discuss better nutrition before pushing meds—Dr. John Backman. I was very impressed with him for he actually had read books such as The China Study. He had a whole list of other recommended books on the same subject to read. He was very helpful in changing the meds to better fit my needs. In my opinion, we contribute to our sicknesses by eating too many processed foods which are devoid of good nutrition and laced with unhealthy chemicals to enhance our taste buds so we will consume more of them. Personally, I look for foods which are organically grown and unprocessed by man. I changed my diet to vegetarian with fish to help myself. The result was that I lost 20 pounds (from 240 to 220) in a matter of 3 months without doing additional exercises. 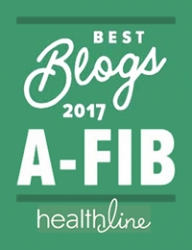 I was feeling better, but my A-Fib was still active at times. The cardiologist explained to me that the real solution lay in having an Ablation procedure. I was not eager to do that and I insisted on alternative solutions. 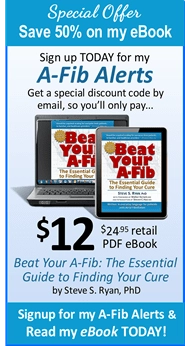 I spent much time reading about such possibilities, and I followed the cardiologist’s advice with the recommended drugs to be used to control my A-Fib. But they only controlled my A-Fib, and weren’t a solution to eradicate it. I was hopeful that I could avoid the Ablation. I was willing to do anything to avoid that surgery. I used a series of medications which seemed to work for a while. But with time, my A-Fib episodes increased along with longer periods of activity and stronger symptoms. My temporary solution to my A-Fib was to rest and try to relax as much as possible. That worked for a while, but eventually I had to get more specialized help by consulting with an Electrophysiologist (EP). However the meds would make me dizzy and slow down my heart rate to dangerous levels…consequently, I had a pacemaker installed to prevent low levels of heart rate. I was given other type of meds in addition to the METROPOLOL. However the meds would make me dizzy and slow down my heart rate to dangerous levels to the point that such levels in fact were counterproductive. My system would compensate by sudden increases of adrenaline and consequently place me in A-Fib mode. Consequently, I had a pacemaker installed to prevent low levels of heart rate. The pacemaker (a recorder) is also useful as a constant monitor of my A-Fib activity. At the beginning, I was placed on the blood thinner Warfarin (to prevent blood clothing) which requires a blood test twice a month to determine the proper level for an individual. After reading about the side effects and dangers, I decided to not use it. Then the new med Xarelto was recommended, and I used it for a while. But noticing how easily I would bruise and bleed, I dropped it as well. My family doctor Dr. S. Mercer, noting that I had high blood pressure, had given me medication (100 mg. METROPOLOL) to help with both issues. It helped with the blood pressure issue and it seemed to help with the A-Fib. But since the A-Fib was sporadic, it was not really a good measure. Dr. Mercer recommended I see an Electrophysiologist (EP) Dr. Ali Hamzei for further evaluations of my condition. The first visit was disappointing for there was not much discussion about alternative methods of cure. His opinion was to do ablation. Well, that wasn’t surprising since his specialty is catheter ablation. I had mentioned books related to better diets to correct disorders by better nutrition, but that was dismissed as not a solution. There was never a discussion about better diets to help my condition. During my ordeal leading up to my Ablation procedure, I was taking various meds in order to control my A-Fib: Diltiazem 60 mg. to control fast heart rate, Propafenone SR 225 mg. 1 daily, Amiodarone 200 mg. 3 per day. I wasn’t taking all of these at the same time. They were taken to determine what would work best for me. After reading about the possible side effects of Amiodarone I dropped it and insisted on something different. I was given Flecainide 150 mg. twice a day. I was told that that is the safe maximum level for this med. Other medications taken on an “as needed” basis were: Alprazolam 0.5 mg for anxiety control, Clonidine 0.1 mg for blood pressure control, Torsemide 20 mg (water pill) to remove excess water in my system which resulted in ankle swelling. However, the Torsemide was actually counterproductive for the removal of excess water and resulted in dehydration which consequently put me into A-Fib. I was getting tired of and frustrated with all these meds. I also knew I was running a high risk of stroke or worse, since I wasn’t on blood thinners. changes mind on having an ablation, at last—success! After too many episodes of A-Fib forcing me to go to the ER, I capitulated against the Ablation surgery and had it done September, 2013. The pacemaker and the eventual ablation were performed by Dr. Ali Hamzei. Both operations were very successful without any complications. I was informed that in most cases the ablation procedure needs to be performed up to 3 times in order to eliminate the A-Fib. The typical success rate is 70% correction with the 1st surgery, 85% with 2nd surgery, and 95% with 3rd operation. Today I am feeling well and doing my daily activities. However I remain cautious in doing my activities not to run the risk of stress, dehydration, too much caffeinated coffee, and getting angry. Currently I am only taking a daily dose of 75 mg. of Flecainide to prevent recurrence of A-Fib which has been working well. As of today, it has been 5 months since my first surgery, and I feel that I may be cured well enough not to have to have another ablation. Since I have had no noticeable A-Fib activity, I am not going to use blood thinners. 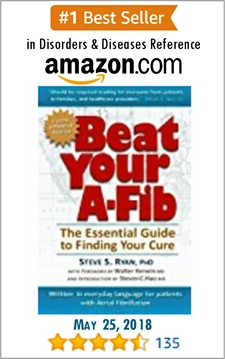 Doctors do not have a solution for everybody with A-Fib. The meds are prescribed to test and see which one and what level of med will work on a particular individual. We need to carefully educate ourselves as we follow the doctor’s recommendations and observe how our body reacts. Do not follow blindly the doctor’s recommendations. 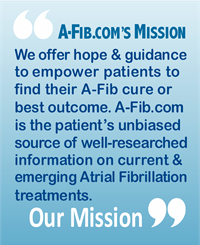 Feel free to contact me by e-mail if you would like more information about my experience with A-Fib. Even though catheter ablation is one of the lowest risk procedures you can have, still no one wants to go to a hospital and have an ablation if they can avoid it. Saul certainly did everything he could to avoid having an ablation—identifying what triggered his A-Fib, vegan diet with fish, all kinds of meds. But right now we just don’t have a magic pill guaranteed to cure A-Fib. A better diet certainly helps overall heart health. But unfortunately, once spots in the heart start to produce A-Fib signals, it’s hard to turn them off. Saul faced the decision that many people have to make. He bit the bullet and had a catheter ablation. Saul’s doctors told him he needed to be on blood thinners, and he was well aware that he was 4-5 time more at risk of having a stroke because he had A-Fib. But like many of us, he couldn’t tolerate blood thinners. (During his ablation and probably for some time afterwards, he was on blood thinners. But this was for only a short period of time.) Blood thinners are not like taking vitamins (as today’s current TV ads imply). They have their own risks and side effects. Whether or not to take anticoagulants is one of the most difficult decisions patients and doctors have to make, and that decision may change as, for example, one gets older. Saul maybe rolled the dice by deciding to not take anticoagulants when he had A-Fib. 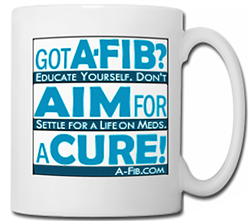 But being A-Fib free is the best way to prevent an A-Fib stroke. Saul’s experience with meds was unfortunate. The meds he was taking slowed his heart rate to the point where his doctor had to insert a pacemaker to keep his heart rate normal. Beta-Blockers like Metoprolol do slow down the heart. If this happens to you, change meds (or doctors). It’s crazy to think about it. Saul’s meds slowed his heart rate which then required he get a pacemaker to speed up his heart rate. What’s wrong with this picture?